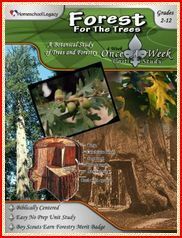 Forest for the Trees is a Once-a-Week Unity Study written by Sharon from Homeschool Legacy and retails for $15.95. Sharon is a veteran, homeschool mom of 16 years and has done a fabulous job writing a detailed thematic unit that puts the joy back into homeschooling. Forest for the Trees is a 4 week study geared towards second through twelfth graders and is intended to help you to take a break from your regular studies and and enjoy a fun, creative, hands-on unit approach once-a-week while focusing on one main topic. In this case, trees. The only thing intended to be used daily are the topical books suggested for independent reading and family time read-alouds. This was a very fun unit for us to use. I love that it helped motivate us to get outside and go exploring. It was great to be learning right along side the kids as we were on the move checking out different trees and leaves in our neighborhood. I love this kind of learning and I suspect our kids do too because they had fun each time we headed out to study various aspects that were covered during that particular lesson. It was a truly satisfying experience teaching our children in this way. 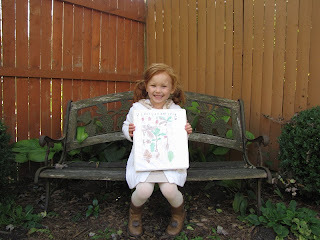 Our children and I both learned a lot about trees and we had fun putting together their nature journal. I used this unit study with all of our children ages 7, 5 and a brand new 3 year old. After trying the recommended schedule, I ended up doing my own thing (I kind of homeschool this way...We get all the work done, but not necessarily in the "right" order.) But, it's okay because Sharon gives permission in her welcome notes to not follow the schedule if that doesn't work for you. :) I tried to leave it to a designated day once a week, but inevitably, something came up so it worked better for us to just do a little bit at a time whenever we were able. So, rather than setting aside one day a week for this, I took chunks of suggested activities, notes, etc. and covered them as we were able to. 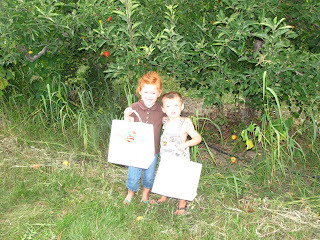 It was still incredibly rewarding and fun and brought joy into our homeschooling day and helped us get fresh air and exercise while we were learning. A major component of this study is to compile a nature journal. 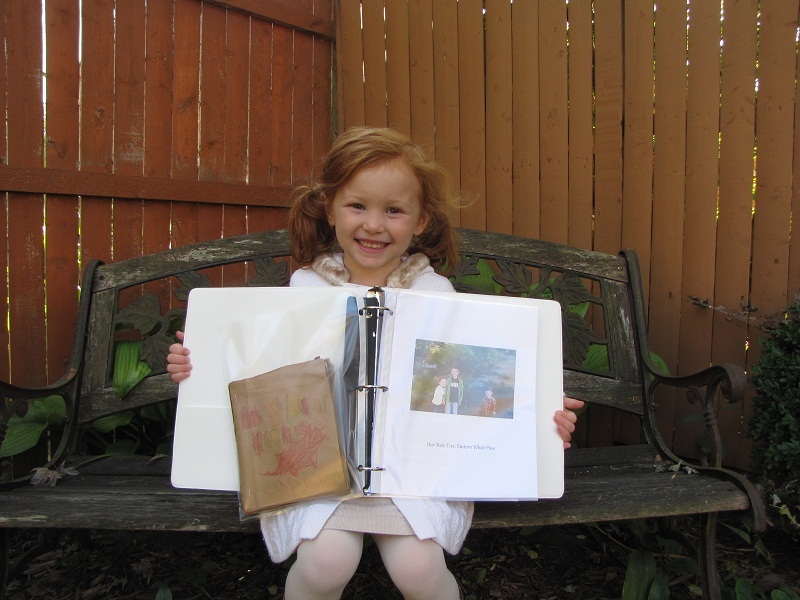 We used a Three Ring binder and I compiled each child's pictures, leaf and bark tracings, picture of the kids in front of our state tree, etc. into the one binder. For the front and back cover, I found a black and white picture of leaves and seeds on Pinterest that the two older kids each colored. I also whole punched the entire unit study and included that in the journal for future reference. Since this unit has a wide age range it would be worth coming back to down the road because each time the children will retain more information. One of my favorite features about this unit study is that there was no prep work involved. Hallelujah. Sometimes life is crazy around here and when we had a few moments I would grab my notes and herd the kids outside for a bit more unit study. It worked great this way for us. Here are some pictures of the various leaves we collected while camping. I cut out large squares from paper bags and the children glued their leaves down and then identified them. 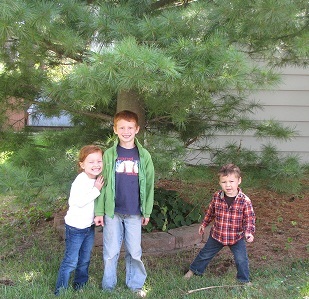 We were encouraged to learn about our state tree and to take a picture in front of it. 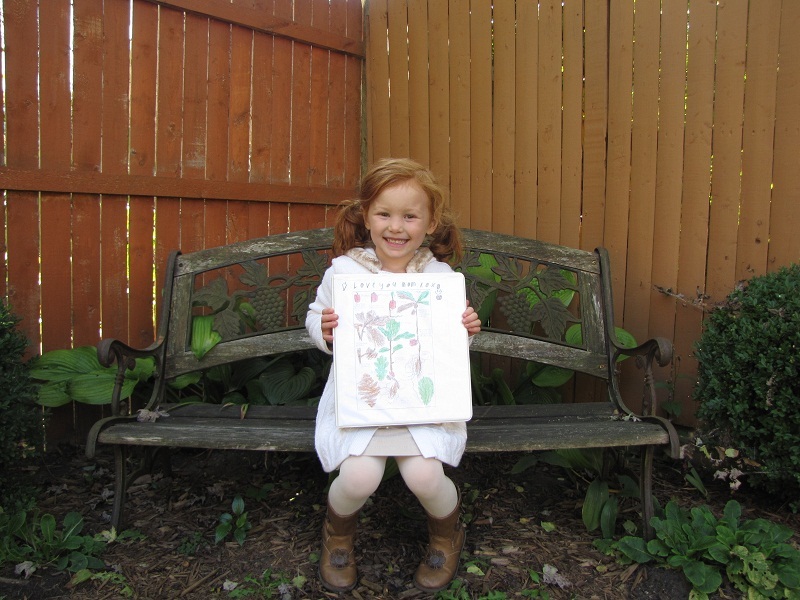 Here is another picture of our nature journal which we are very proud of. Throughout our study, we discussed that God made the trees and that they reproduce after their own kind. 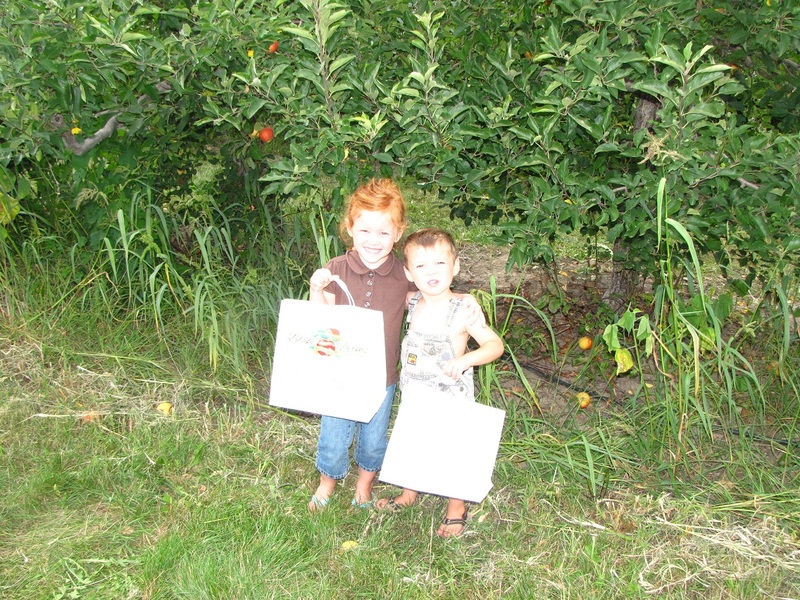 We also talked about which trees we have picked our own fruit from and what we have done with it. We discussed how we use trees (maple syrup, building homes, bonfires, heating homes and more) and how people and trees have a symbiotic relationship with each other. We need them to produce oxygen and they need our carbon dioxide for photosynthesis. "Without carbon dioxide trees would be unable to make their own food." source Pretty amazing, huh? This was a very enjoyable unit and one that I hope to do again with our children in the future. As they get older we can get more in-depth with our study, and as I mentioned, each year they will retain more and more information. Sharon has done a fantastic job compiling all of this information into a fun, easy-to-use format. I would definitely recommend it! Since we enjoyed this unit study so much I'm sure we'd enjoy Homeschool Legacy's other unit studies, too. You can check those out here. If you have any questions, I know Sharon would be more than happy to help. You can email her here. The link to Homeschool Legacy's other unit studies is broken. Thanks for the review. I really enjoyed reading your thoughts.